On February 21, 2019, State Councilor and Foreign Minister Wang Yi and visiting Foreign Minister Chingiz Aidarbekov of Kyrgyzstan jointly met the press after their talks in Beijing. A journalist asked what consideration the Chinese side has for the development of the Shanghai Cooperation Organization (SCO) for the next stage. Wang Yi expressed that the Chinese side successfully held the Qingdao Summit last June, during which President Xi Jinping put forward new vision on development, safety, cooperation, civilization and global governance and summarized the basic connotation of a new type of international relations, charting the course for the SCO's development. The Summit also reached new consensus on cooperation in such fields as politics, security, economy, people-to-people and cultural engagement and exhibited the SCO's cooperative and enterprising spirit after its first membership expansion, thus promoting the SCO into a new phase of development. Wang Yi said that the Kyrgyz side took over the rotating presidency and well fulfilled its responsibilities after the Qingdao Summit. The Chinese side stands ready to work with the Kyrgyz side and other member countries to fully implement the outcomes of the Qingdao Summit and push the SCO's cooperation in various fields to new heights. First, we should have new measures for security cooperation. At present, as the regional security situation remains complex and grave, member countries need to make joint efforts; we should push forward the SCO Convention on Combating Extremism to take effect as early as possible and step up efforts against terrorism, separatism and extremism; we should improve the functions of regional anti-terrorism organizations, and deepen cooperation in fighting against drug trafficking, maintaining security of internet information and other fields; we should strengthen intelligence exchanges, personnel training and well conduct various counter-terrorism exercises to improve the ability in joint action in law enforcement cooperation; and we should further give play to the role of SCO-Afghanistan Contact Group to actively take part in the political reconciliation process of Afghanistan. Second, we should have new actions in practical cooperation on which hinges upon happiness and sense of gain of people in member countries as well as vibrancy and future of the SCO. We should deepen the integration of the joint building of the Belt and Road Initiative and development strategies and regional cooperative initiatives of all countries to inject strong impetus into practical cooperation; we should accelerate promoting trade facilitation, and launch the feasibility study of the free trade zone as early as possible to fully release the cooperation potential, elevate regional connectivity and boost regional integrated development; and we should continue expanding scientific, technological, local as well as people-to-people and cultural cooperation to propel the SCO cooperation to grow in breadth and depth. Third, we should shoulder new responsibilities in international and regional affairs. The current world is undergoing profound changes unseen in a century and faced with unprecedented risks and challenges. The international community looks forward that the SCO will play a greater constructive role to inject more positive energy into the current international situation. The SCO should make its voice heard on major international and regional issues in a timely manner, especially in upholding multilateralism, safeguarding international fairness and justice and striving to build a new type of international relations and a community of a shared future for mankind. 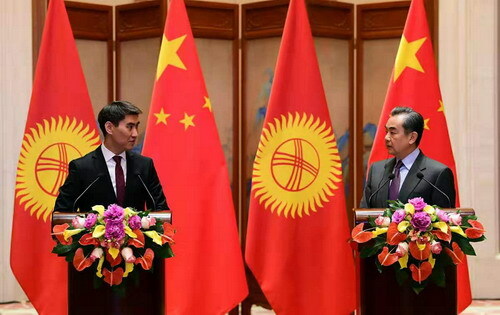 We believe that under the careful preparation of the presidency of Kyrgyzstan and joint efforts of all sides, the Bishkek Summit will achieve a complete success and break the new ground for the SCO's development.